With a goal of placing a ‘washing machine in every household’ and with a vision of ‘When technology meets common man, World prospers’, a Mumbai based startup is aiming to offer fully functional, portable washing machines for only Rs 1500. This is unique one-of-its-kind device to wash clothes has been named: Venus – The Mini Portable Washing Machine. The startup has already shared their plans with crowd-sourcing platform IndieGoGo, and have pitched to raise $50,000 (Rs 30, 00,000) before December 12, 2014, which will enable them to mass-produce this exciting device, and fulfill their mission and vision. At the time of writing, $1250 out of $50,000 has already been raised. 1 How Will It Work? 2 Why Should One Use It? This washing machine can be described as an electronic hand blender, which is small enough to be carried in a backpack and large enough to wash 4-5 clothes in a bucket, with strikingly good results. Every wash will take maximum 4 – 5 minutes, and it is being advised that the machine be used for 30 minutes in a day. Washing those clothes which are used to mop floor or clean the kitchen, as washing them with your clothes can be a bad choice. 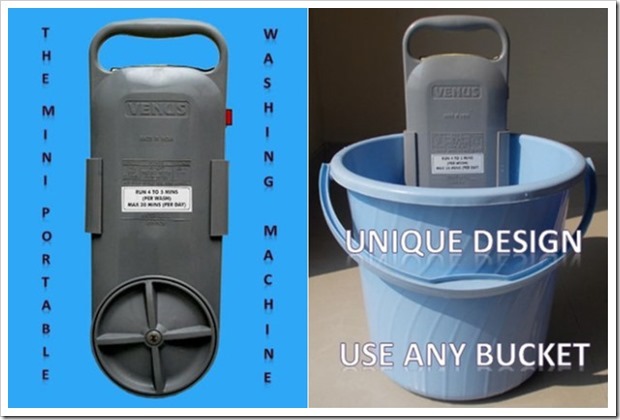 Travelers and traveling sales men can keep this portable washing machine in their backpack, and use it in hotel or lodge. The founders of this extremely economical and useful device have stated that once their project receives the required crowd-funding, they will also embed DC or Direct Current mechanism into it, which will help user to operate using batteries as well. Check out the Founder Piyush Agarwalla’s thought process behind producing this device. Besides, mass producing this device will help them bring down the cost and make it even more affordable to purchase and use. What are your views on this invention? Will this portable washing machine be adapted en-masse by those who don’t wish to wash clothes by their hands and can’t afford expensive washing machines or this device is not practical to use, as clothes needs a tough and expensive machine to get washed? Do share your views by commenting right here! "Indian Startup Creates Portable Washing Machine Costing Only Rs 1500 / $25", 5 out of 5 based on 1 ratings. Price should be Rs 100 for one round of wash. Rs 150 is bit expensive. Ayush, the product on ebay is also from us. You are right. We have been at this for some time now. However, the initial model had several drawbacks and was withdrawn. With the feedback we received by selling a small quantity in the market, we have now a fully tested and tried model in various working conditions. In fact, the machines that will be made post December, will be insulated with a space age super insulating spray imported from Russia. This machine can be immersed in water with power ON and still there will be no electrocution. Please see our campaign page on Indiegogo. I have posted a video about this super insulating spray. Excellent invention. I hope you get it patented and get govt. support to keep out copy-cats. Lol! My parents bought something like this 10 years ago at an exhibition. Nice article. Gives exposure to innovative concepts. In the West, innovations are sold to or are shared with professionals who do the complete packaging. As you can see, in the above comment one reader expressed a concern regarding electric device in direct contact with water. In the West the Companies which get new concepts have a number of professionals. Some work with safety features, some with technical side, some with user friendly design, some do marketing. Every one shares the success. In India we read every now and then some new concepts tried by ordinary people. For example, one ordinary mason deviced a lift at construction site using the power of a scooter. We don’t know what happened after that. One ordinary farm laborer invented a mechanical harvester using motorcycle. So many stories which had so much potential. After some time we all forget the news. We never know what happened to those innovative concepts. Propably the innovator could not find investors and the concept died grudgingly. America did not become World No 1 with armies. They developed on inventions and most of their inventions are put to practical use. Really feel sad for the lack of organizational skills in India. Altaf, I fully agree with you. In India, it is very hard to incubate new ideas unlike in US where VCs immediately come to your aid. Because of this very reason, we chose to seek funding on an international crowdfunding site. Several blogs and websites like trak.in have supported us by featuring an article like this. Today thousands of Indians are aware of this product and the reason we are out there. Unfortunately, so far only 4 Indians have supported us with contribution while rest of the funding coming from US and elsewhere. Indians are liking it on twitter and facebook, but not contributing. We are confident that we will achieve our goal and succeed in bringing this machine at an afforable price of Rs1500 so that poor family women can start using them and not be forced to do daily laundry by hand. As regards to electrical shock, please note that we have importeda space age spray from Russia. What it does…why don’t you see for yourself on our campaign page. I have posted a video. With bigger community, you will have much more success with raising the funds. The only thing is, it doesn’t look very safe. There’s a serious risk of electrocution in using a electrical device in water…same reason you need to be careful with a hair dryer in the bathroom. Wow! That makes me so proud of being an Indian myself!